marital bless: It's about time! Before you freak out, this is a curling iron! Yes, a curling iron. And after a year of using it in it's present state, I finally went out and bought a replacement. I'm not sure if it was the 149th or 150th burn that I experienced on my right pointer finger that forced me into action, but my steadfast curling iron from Sophomore year of high school is no longer my ally. Oh and while I was spending the $15 on the curling iron, I scored a sweet pair of jeans at Target on clearance . . . for $5.76!!! To only make it sweeter, they were Moss Supply Co (which are designed to fit like Abercrombie/Hollister - just an FYI) and I was able to slip into a size 7! I'm glad your sparred your finger from another burn. Sophomore year of high school -- I don't think I have ANYTHING from my sophomore year of H.S.! Wow! Score on the Size 7....especially Target jeans. Those are made for teeny meenies! Phew - that curling iron scares me! Haha. I'm glad you replaced it. As for the size 7 jeans, one word comes to mind... jealous. :) Way to go girl! Woohoo! Good finds! 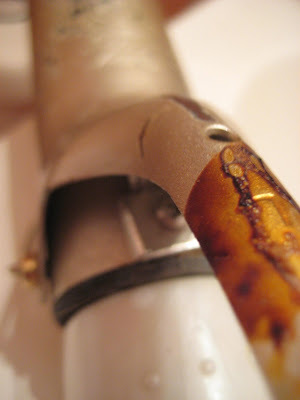 I cracked the top of my hairdryer open probably about 6 months ago and have yet to replace it. It still works :) So I feel ya on the curling iron. Leah you are too funny!! Glad to hear you got a new curling iron!! Way to go girl fitting into a 7!!! Sophomore year? Wow is all I have to say! I'm glad you finally replaced it and will no longer be burning yourself.